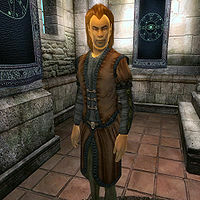 Calindil is an Altmer enchanter and proprietor of Mystic Emporium, where he sells spells and a wide variety of magic items. The unique gauntlets Hands of the Atronach can be purchased only here. Running the only enchanter's shop in all of Cyrodiil can be hard work, and Calindil spends a huge part of his life dedicated to his duties. Fortunately, he still manages to make the most of his spare time and spends his evenings walking to various destinations in the city. He sleeps in the private quarters above the shop and wakes up every morning at 6am. He starts the day with a two-hour breakfast in the main trading room before unlocking the door for potential customers at 8am. After tirelessly offering his services for twelve hours straight, he closes up at 8pm and leaves the shop. On Morndas, Middas, and Fredas, he will go to the Merchants Inn and have dinner with the other merchants and traders. Tirdas sees him strolling relaxed around the Green Emperor Way. On Turdas, he will go to the Temple of the One for an evening prayer. On Loredas and Sundas, he will head to the Arcane University and wander around the outer areas, while chatting with the scholars and apprentices there. On all days, he heads back to Mystic Emporium and his bed at midnight. He wears a russet felt outfit with matching shoes. He carries around a spare pair of burgundy linens, his shop key, and a leveled amount of gold. He also carries an empty grand soul gem and a sample of glow dust, both of which can be purchased from him. On combat, Calindil relies on the same set of spells that you can purchase from him. When you meet him for the first time, he will introduce himself and his services: "Welcome to the Mystic Emporium. Calindil is here, with all your needs, under one roof. Look, and buy. Nothing could be easier." When you ask him about his beloved city, he will tell you, "No one can experience the City for you. You must go, walk, touch, see, feel, talk to everyone." Other citizens seem to agree with Calindil's own statement about his shop. They can be heard saying: "Calindil runs a nice place at the Mystic Emporium. "; "If you need something enchanted, Calindil has the goods. "; and "Do you ever buy soul gems from Calindil?" If you purchase the Wizard's Tower official plug-in, Aurelinwae joins Calindil as a second merchant in the Mystic Emporium. It is not possible to invest in Calindil's store, even after you have reached 75 skill in Mercantile. Esta página foi modificada pela última vez à(s) 05h20min de 20 de outubro de 2015.